The new Anzac Station will significantly improve access to the St Kilda Road precinct and key Melbourne landmarks, reducing pressure on the road and tram network to the south of the CBD. The station is strategically placed to ease pressure on the St Kilda Road / Swanston Street tram corridor, which is the busiest tram corridor in the world. It will feature a convenient, direct train / tram interchange within a new tram super stop on St Kilda Road. The station will serve thousands of people destined for the employment and residential precinct along St Kilda Road every day, and support the continuing growth and redevelopment of the South Melbourne / Kings Way precinct. It will also make it easier to visit some of Melbourne's most valued parks and attractions such as the Shrine of Remembrance, the Royal Botanic Gardens and Albert Park. 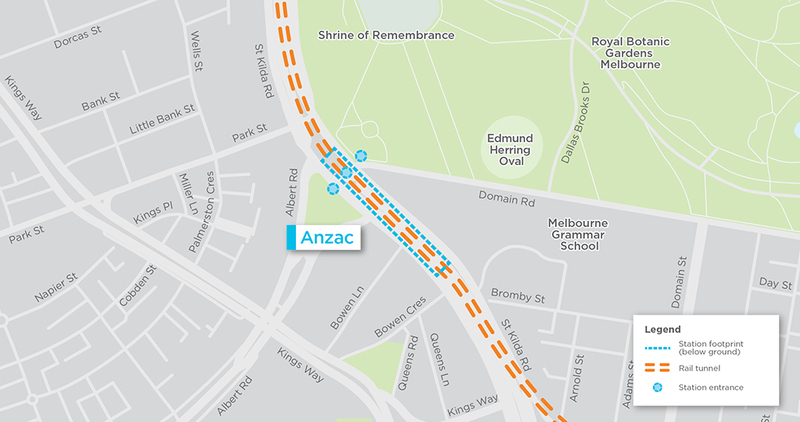 Anzac Station will be located directly under St Kilda Road near the intersection of Albert Road and Domain Road. It will be accessed from four entry points. One entrance is located on the outer edge of the Shrine of Remembrance Reserve, another at the Albert Road Reserve and two further entrances are provided at the new Domain train/tram interchange directly above the station on St Kilda Road. Albert Road Reserve will be expanded and enhanced as a community park, providing a green link between the Shrine of Remembrance Reserve, Domain Parklands, Albert Park and beyond to Port Phillip Bay. The station location is the result of detailed investigations, design and planning by engineers, transport modellers and other experts with experience on rail tunnels and other infrastructure projects in Australia and around the world. Read more about the location assessment. A new tram interchange, the first in Melbourne with a direct platform-to-platform connection between the train and tram network. Extra large tram platforms will accommodate four trams at any one time (or two 33 metre long E-class trams in each direction), and cater for large crowds for events such as Anzac Day and the Grand Prix. A new pedestrian underpass linking Albert Road Reserve and the Shrine of Remembrance Reserve with the new station and tram stop, allowing people to safely cross underneath busy St Kilda Road. New bus stops with shelters on St Kilda Road to enable passengers to easily connect with trains and trams. Drop off zones and taxi zones located near the Albert Road Reserve station entrance. 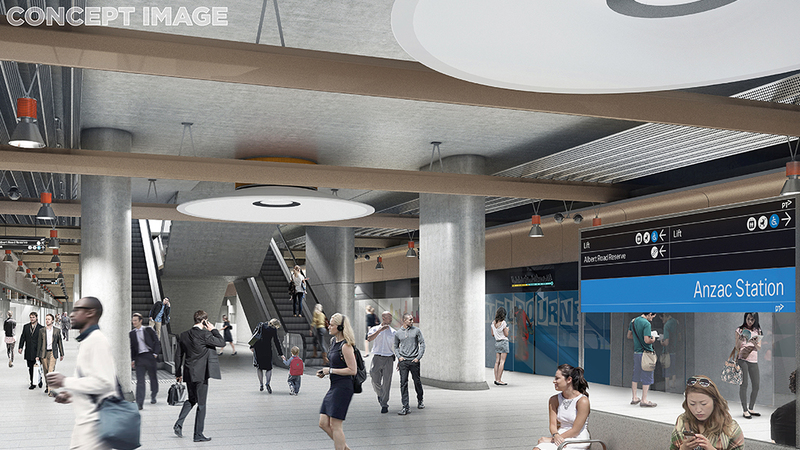 Over 120 new bike parking spaces, including space for bike parking in the station forecourt. A shared use path through the new Albert Road Reserve, opening a new and safe cycling and walking connection. The project will increase overall tree canopy coverage in the station precinct, with new trees planted on St Kilda Road and in the surrounding area. 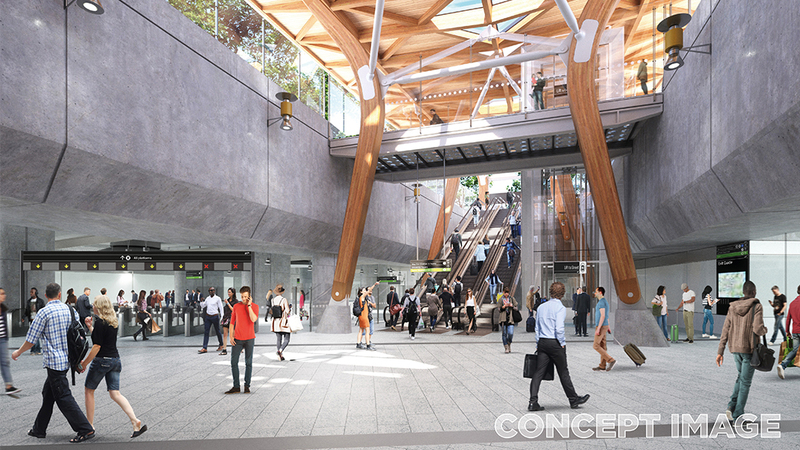 The tram platform will also feature trees and dense low-height landscaping. Following detailed design work, the number of trees impacted in this area has been reduced from 224 trees to 170. In the Albert Road Reserve, the Windsor Oak has been protected, as have many of the existing elm trees. Sloping down from the Shrine of Remembrance Reserve to Albert Park, the expanded Albert Road Reserve will be a biodiversity corridor, bringing nature into the city through diverse landscaping. Landscaping for St Kilda Road will use leading water sensitive design to capture and treat stormwater and provide passive irrigation. Water will be collected from surrounding roads and directed to the new Albert Road Reserve on St Kilda Road. From Albert Road Reserve, the water will be filtered through landscaped areas to support tree and vegetation growth. Important heritage features will be preserved, with the reinstatement of this section of St Kilda Road as part of Melbourne's grand boulevard, the reinstatement of Edmund Herring Oval as a place for recreation, and the restoration of the South African Soldiers Memorial within Albert Road Reserve. 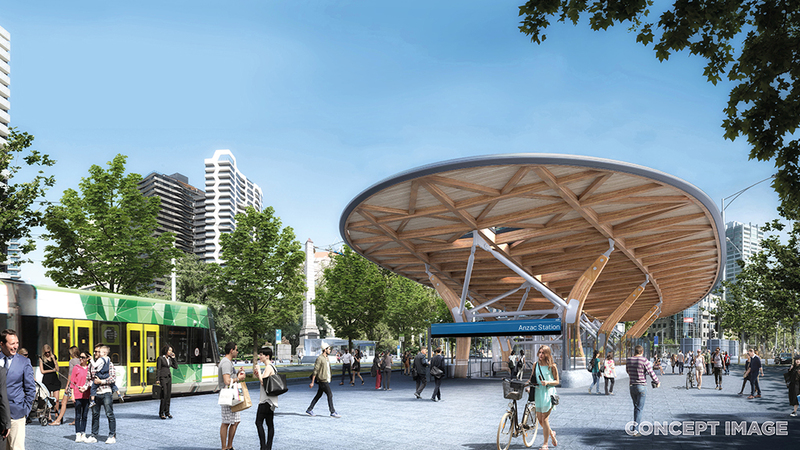 Visual impacts have been reduced by creating low key entrances on either side of St Kilda Road, ensuring the entrances are within the height of the tree canopy and reducing the station footprint.